In the continual quest for weight reduction I'm thinking of pulling the power steering from my track car (I know there's an electric conversion). I've read a few threads but haven't found someone that has actually done it. I've owned non powering steering e30s and know manual steering is a rough life. Is anyone running manual steering? Bonus question, how much weight are we talking about? More so than the weight savings, the rack is ratio-ed to be power assisted, take away that assist and the effort required is going to jump up to arm wrestling levels. I'd suggest first try driving the car with the pump disabled before pulling it out. driving with the pump disabled is not a real simulation of manual steering. with a disabled pump you have to push the fluid through the pump - not so with a manual rack. i have a professionally depowered rack but haven't had the chance to install it yet. i have spoken w folks with 996's who are running manual steering (LS conversions) and say it is not an issue (slightly different weight distribution, however). probably not a lot of weight loss (10 lbs?) but also note less parasitic drag on the engine. with a track car however, note that you'll most likely have wider front tires that will increase steering effort, as well as the possibility of your steering biting back in an off. In terms of electric conversions I suggest the MR2 unit or the VAUXHALL ASTRA unit. They should be very easy to implement since Frunk space isn't as limited as front engine cars. Self sensing contained unit. Perfect for racing use. I preferred the manual rack in my 944 race cars, even with 275 slicks up front. I would consider the swap in my boxster if it was legal for SPB. the other concern is serpentine belt. with both ac and ps gone, you need a dummy pulley up in that corner to keep things turning. gsr made one but are out of business. porsche made one for thte cayman r but that was a dfi engine. i found a cheap one and am about to check to see if it fits. Please give us an update on the pulley solution and/ or share the product and source. I am looking for a solution to this problem now. ok. i will confirm and provide pics tonight or tomorrow. Idler pulley solution is to gut the insides of the pump....remove impeller etc. So basically left with a bearing and a pulley...mounted in the original pump casing. A guy in Germany had built a lw 996 c2 and took his rack to bits for manual steering. Says it is not much heavier at all but tonnes more feel. 1/2" plate w 3" pulley, designed to mount to the same flange that the ps pump mounts to. gsr gone, but perhaps contact hergesheimer motorsports as i *think* they had some affiliation with gsr? the dfi engines have a different belt routing and need an idler pulley if you delete the ac. 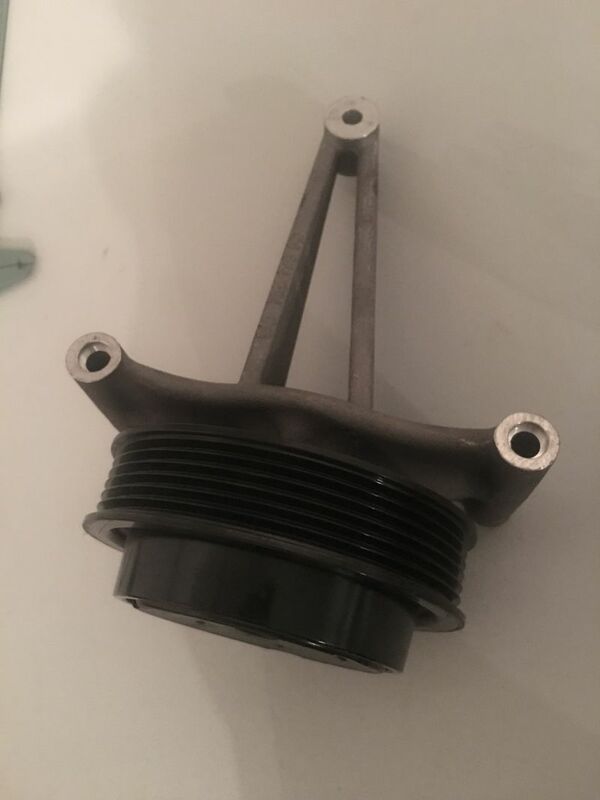 this is the oem porsche part for the cayman r. i cross-referenced part numbers and the ac compressor is the same part number for the m96/m97 and dfi engines so i thought it would work on my car. wrong. must've been screwed by the part # cross-references. so, anybody want a 987.2 ac delete pulley? I guess I will try this solution. There is a ps pump kicking around somewhere in my shop. GSr part looks easy enough to replicate. There are a ton of pulleys with bearings in them in various cars. A trip to a wreckers may prove fruitful. 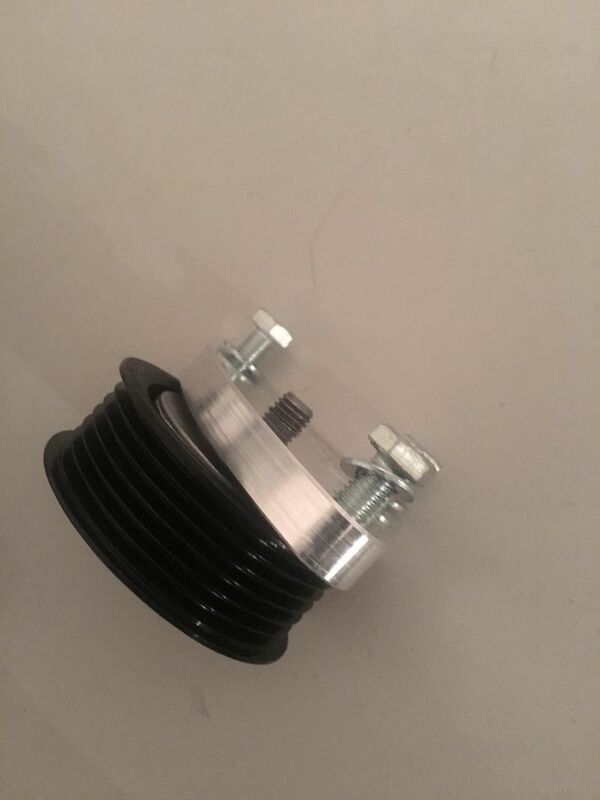 UK eBay but I just searched for idler pulley. that looks to be it. lemme know and i can provide additional dimensions for the gsr mounting plate and fasteners. The above one is 70mm. Can you provide an alignment dimension...to get this idler offset correctly to line up with the belt? Just curious if a real manual rack from a 993 or 964 might fit as opposed to de-powering a boxster/(I assume 996) rack. Does the Gt2/gt3 still have a power rack? i'll get better dimensions in a bit. really, the gap between the pulley and 1/2" plate is quite small (a few mm). this is why the fastener length is important, otherwise you'll run into interference between the fasteners and the pulley. i think that the final alignment is just attained by how far in you thread in the pulley. Fair comment on final thread alignment...you'd have to rely on thread lock if the stud isn't bottomed out.